RCATheremin.com was created and set up by Mike Buffington and Andrew Baron to provide a home for the updated and expanded RCA Theremin Registry (which was previously hosted at ThereminWorld.com) and to collect, cultivate, and disseminate previously hard-to-find information on the esoteric, historical, technical, and practical considerations associated with the first manufactured electronic musical instrument, the RCA Theremin. Instructions on how to play a theremin are not included here, but you will find a wealth of valuable information on safely setting up and handling the RCA Theremin, a clear set of instructions on how to set the user-controls, previously unpublished instrument-voicing guidance, basic troubleshooting advice, and more. This site is also home to the first organized compendium of Leon Theremin’s rare surviving hand-built electronic musical instruments. During his approximately 11-year residency in the U.S., Professor Theremin, his Theremin Studio, and his corporation Teletouch produced a variety of ground-breaking instruments, emerging first from his Plaza Hotel Annex and later from his laboratory at 37 West 54th Street in Manhattan, New York, from early 1928 to the autumn of 1938. These include prototype and built-to-order theremins, theremin cellos and the sole surviving U.S. built rhythmicon. Submission of previously unrecorded RCA Theremin serial numbers is especially encouraged and appreciated. In addition to providing the most accurate and up-to-date survival rate information, by cataloguing the serial numbers we can establish a greater knowledge base, and share new findings through the practical study of common traits and differences in the production. We welcome you to be a dynamic part of this web site: If you own or know of an RCA theremin that is not currently listed in the Registry, please take a moment to read the information we are requesting, and get in touch by email. Follow our Twitter account, @RCATheremin, for site updates and news! Andrew, 57, is a long-time devotee of innovative early technologies. He was irretrievably inspired by Theremin An Electronic Odyssey at his local art cinema in 1996. It was not only the remarkable story and masterful filmmaking, but watching Clara’s hands and hearing the magnificent result, that brought Andrew back for three more showings. Noting Bob Moog’s mention of his first published theremin design, Andrew determined to recreate Moog’s ground-breaking Model 201 theremin of 1954. Andrew made a few changes to the basic 201 design, including an upgraded audio section (based on a period-correct Fender amp circuit), along with improved linearity based on advice from Dr. Moog, and a 2 inch oscilloscope to facilitate setting the tone colors. Andrew has restored a number of RCA Theremins for museum and individual collections, including the RCA at The Franklin Institute Science Museum, which had been out of service for more than 56 years. Also for The Franklin Institute, Andrew restored the famous Ca. 1800 Maillardet Automaton, the drawing and poem-writing clockwork figure that inspired Brian Selznick’s book The Invention of Hugo Cabret, which in turn led to the 2012 Academy Award winning Martin Scorsese film HUGO. In his other worlds, Andrew is a paper engineer (designer of pop-up books), with a number of innovative, award-winning books to his credit. Andrew draws freely from his machine experience when creating books. His published work can be seen at Popyrus Studio. Mike, 36, is an industrial designer, graphic designer, and illustrator with a keen interest in musical instruments. The theremin found Mike sometime back around 1994 or 1995. He has a fuzzy memory of a thereminist performing on a late night television show, likely episode 211 of Night Music which featured a clip of Clara playing, and sought out more information in his school’s encyclopedia and on the primitive theremin webring. He checked out Steven M. Martin’s documentary from his local library and the obsession grew. 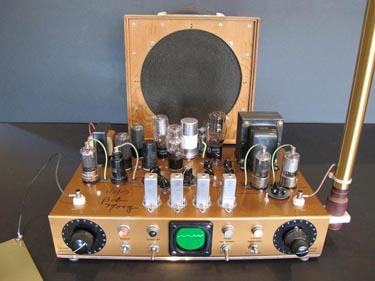 Around then, the dream of having a vacuum tube theremin germinated. 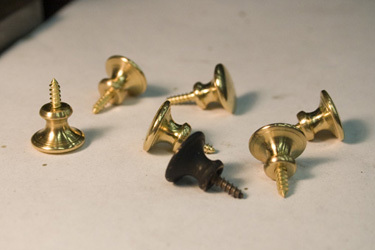 Six of Mike's handmade, RCA spec door knob replicas, with original. 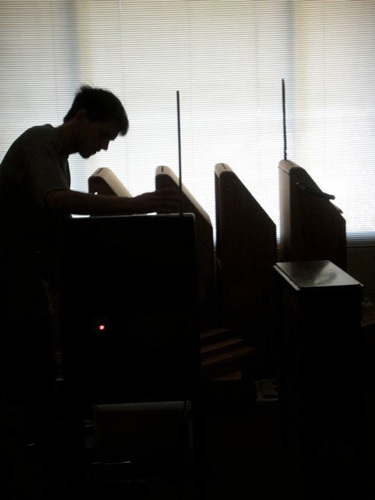 In 2005, Mike started building a replica RCA Theremin from scratch, which he documented on his blog and completed in 2007. Next, he purchased an original RCA Theremin in non-working condition and used the skills he developed from making his replica to restore the RCA Theremin to working order. Since then, Mike has measured and mapped every detail, inside and out, of the Jamestown Mantle Co. cabinet and many of the components. 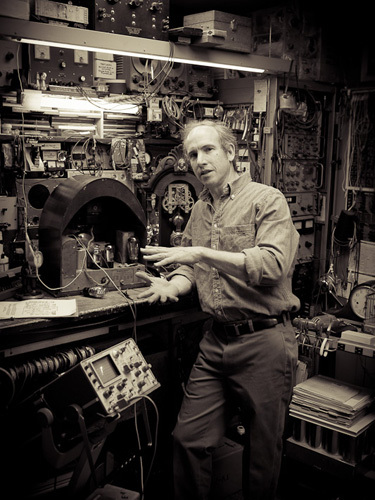 With this information, he has created a small batch of perfect replica cabinets for RCA Theremin owners whose instruments are missing their original cabinet, as well as replicating various parts such as antenna, pilot light extenders, paper labels, and hinges—all of which are unique to the RCA Theremin and cannot be found anywhere else. To see other projects and design work by Mike, visit his design portfolio at Mike Buffington dot Net. Mike, with his RCA and four of his replica cabinets. At RCATheremin.com, we respect the priority of copyrighted work. All written content and illustration have been composed solely by the authors of this website. We have received permissions for images where practical, and would be happy to add photo acknowledgement where appropriate.